Kalamazoo, Michigan band, which was formed in 1986. 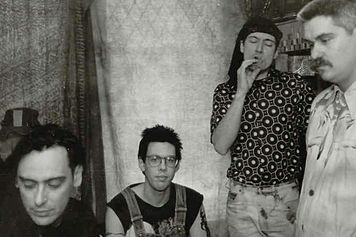 They debuted with 1988 single “All I Want Is My Momma”, followed by numerous singles and full-lengths, including 1989 “Mama Womb Womb”, 1990 “Plastic Eye Miracle” and 1994 “Kill The King”. Although they never achieved any commercial success during their existence, God Bullies remain favorites among many. Most of their records explored forbidden/taboo subjects like death, psychosis and murder, as well as more common topics, such as religion (they also used to light bibles on fire while performing). After their demise, lead singer Mike Hard went on to form Thrall. Mike Hard played alongside Ron Asheton in the movie “Mosquito”, which came out in 1995. Hey thanks for linking the myspace. I uploaded the videos for Cemetery and Ordinary Man to YouTube if you want to put those on here.